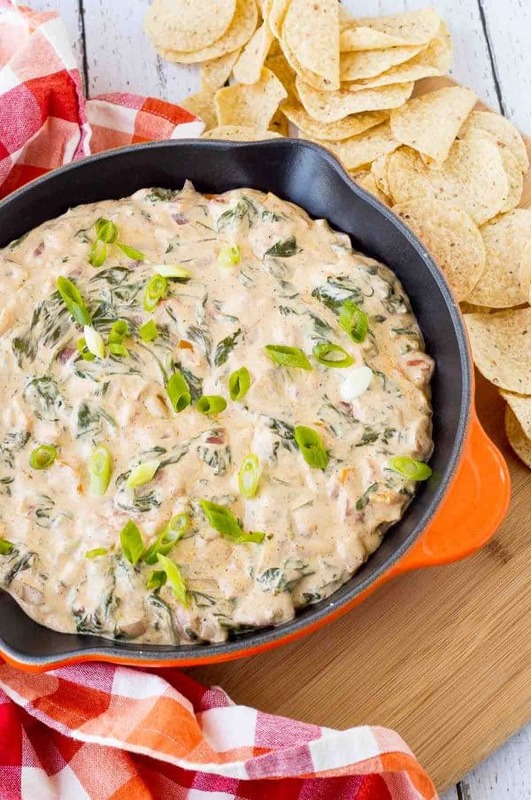 Surprise party guests or family members with this fun and festive take on spinach dip. 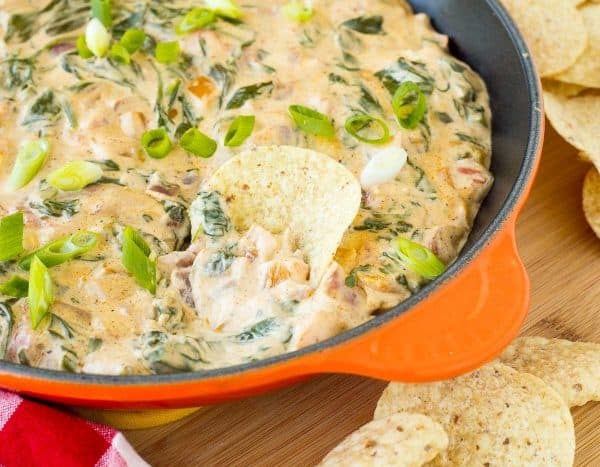 This Mexican spinach dip will be a new favorite! 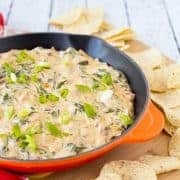 Spinach dip is one of my all-time favorite things. 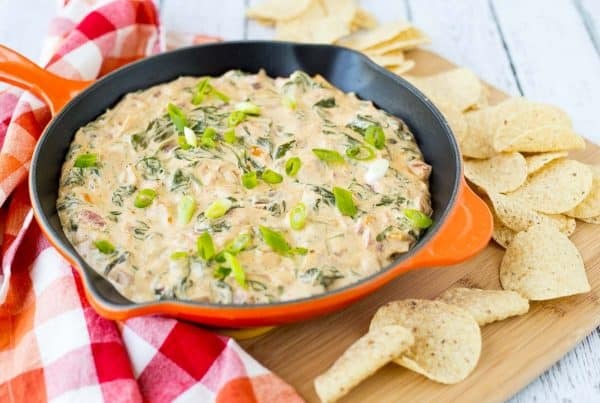 I feel like everyone loves spinach dip. A true indicator of a restaurant’s quality (especially a chain or sports bar type place) is a taste test of their spinach artichoke dip. Let’s be honest, it’s not a complicated situation: cheese, spinach, artichoke hearts…get it nice and hot and bubbly and serve with some salty chips. But if it’s on the menu at a restaurant and they can’t produce a good quality dip, I might not be returning for round 2. 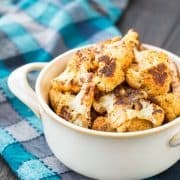 I must be on a spinach dip kick because I recently stuffed spinach artichoke dip (or a mixture similar to it) into hasselback chicken breasts (side note: have you tried those yet? SO GOOD.). And now I’m back with Mexican spinach dip, and let me tell ya…there’s a few reasons to make this stuff for a crowd. For one, it will be a complete and total hit. For two, if you don’t make it for a crowd, you’ll eat it all yourself. Not like I’m speaking from experience or anything. I used a combination of pepper jack cheese, cumin and chili powder to give this dip its Mexican flavor. I used bell peppers, red onions, and tomatoes to drive the flavors home. I don’t love super spicy food and I loved this so I think the level of spice would be perfect for a large crowd, it’s really subtle with just a little warm heat. If you’re worried or if you try this and feel as though it’s too spicy you can do one of two things. You can reduce the amount of chili powder or you can use Monterey Jack cheese in place of the pepper jack. I would urge you to try it as is first though, because if you mess with it too much you’ll be left with plain ol’ spinach dip instead of Mexican spinach dip. 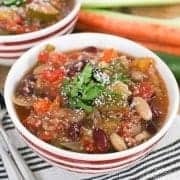 You’ll need to prepare this dip on the stove to sauté the onions and peppers but afterwards, you can keep it warm in a crockpot to serve at a party. In a very large skillet, heat oil over medium heat. Saute pepper and onion for 3-4 minutes or until softened and onions are translucent. Add cumin and chili powder and cook for 1-2 minutes to toast spices. 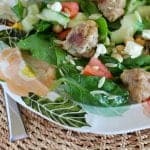 Add spinach and tomatoes and cover for 2-3 minutes or until spinach is wilted, stirring as necessary. Reduce heat to medium-low and add pepper jack cheese, cream cheese, and milk. Continue to stir until all the cheese is melted and combined into a smooth dip. Serve immediately with tortilla chips. May also be kept warm in a slow cooker (on “warm” setting) for entertaining/parties. Store leftovers in an airtight container in fridge 2-3 days. Reheat slowly in a saucepan over medium-low heat. Verdict: I think you all already know how I felt about this. Literally couldn’t stop eating it. Changes I would make: None are necessary! If you wanted to switch things up, you could garnish this with jalapenos or cilantro.